My friend, Lynne, gave me a dishtowel with a picture of one of these babies on it, adding a little vintage flair to my kitchen. She knows how much I love old stuff, and she told me about a friend of hers who actually uses one today. After enjoying a fabulous cup of coffee at her friend’s house, Lynne decided to get one for herself, which spurred the dishtowel purchase and the sharing of the story. 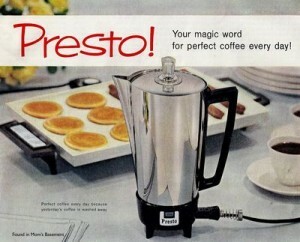 As you can see in the ad, this percolator was part of the 50’s “kitchen of the future,” giving the average American housewife ease and leisure, and freeing her from the chains of archaic appliances and doing everything by hand. Even the name “Presto,” made it the “magic wand to perfect coffee.” The irony is that, today (according to Lynne), the Presto takes a full 12 minutes to brew a pot of coffee, and that’s a loooong time, amen? At this point, you have to be wondering why in the world she bought one for herself. After all, we are in a time that the 50’s couldn’t even fathom. What they considered fast, instantaneous even, is something that would find us literally pulling our hair out in furious impatience. “Give us our Keurig and the K-Cup” we say, giving us, literally, any coffee under the sun, one quick and efficient cup at a time…and in about 1 minute or less. I mentioned that she said it was one of the best cups of coffee that she remembered, so that was the initial motivation. But she discovered that, in that twelve minutes, she got her dogs’ morning constitutional handled while her house filled with the tantalizing aroma of a fine dark roast. She found her heart slowing to the rhythm of the percolating sound; a harkening of pleasant memories from her childhood, yes, but also a reminder that good things come to those who wait. I know the trendsetters of days-gone-by were only trying to help, but in their efforts to make life easier and tasks faster, they inadvertently robbed us of the joy that comes from making something delicious by hand, and exercising patience to go through a process, knowing it will yield a superior result. We’ve come to settle for less because it’s faster and can be in our hands or mouth almost the instant we desire it. We’ve forgotten that the best things in life are most often not instantaneous. The best things require a slowing down to enjoy the work-in-progress; a percolating, if you will, as the aroma of the prize ahead fills our hearts and minds, spurring us on to the end. They require an investment on our part that makes the reward so much sweeter. Like a fine dark roast, long-brewed to perfection. Kind of makes me want one of these treasures for myself. **I’ll be off-blog, starting tomorrow, as I’ll be with my babies. Look for grandbaby-isms on Facebook for the next week! This post filled me with memories since that’s the kind of coffee pot we had in my teen years. 🙂 You brought us a good lesson on patience through this vintage coffee pot! !